Here come displayed 16 selected photos showing just as many outdoor patio ideas of different styles – from the traditional Spanish patios to some very avant-garde examples. 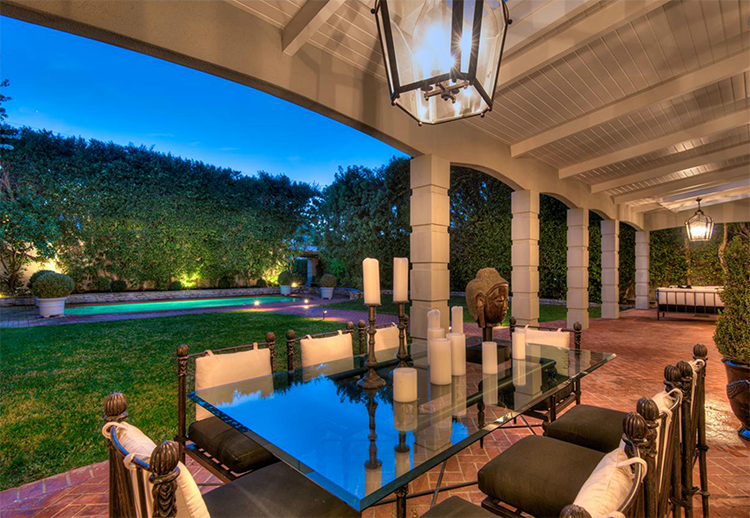 Common element of many mansions and villas, the patio has the function of providing a house with an outdoor space for dining and recreating. 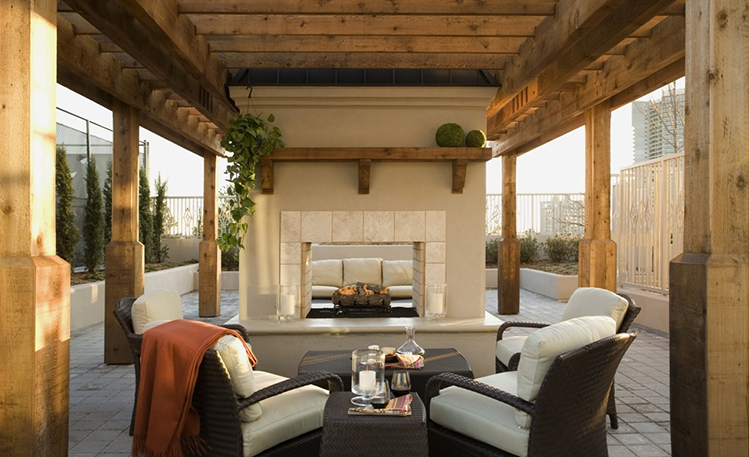 Patios must be beautiful, being the first feature that guests notice in a house. 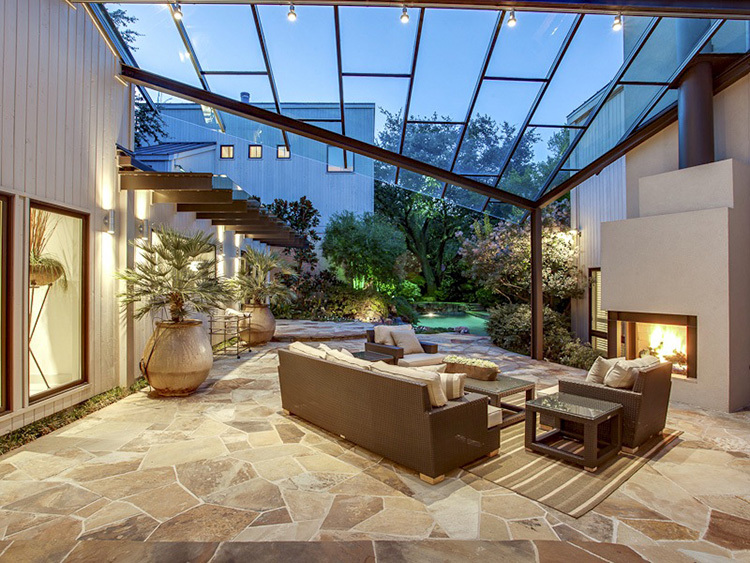 This is probably the reason why patio designs are so intriguing. We publish this selection of photos of patio designs with the hope that readers will find them useful to develop their own patio design concept. Among our luxury patio ideas, this traditional outdoor patio with classical reddish pavers and wooden roof is probably one of the most scenic thank to its location just in front of the garden with the swimming pool in sight. 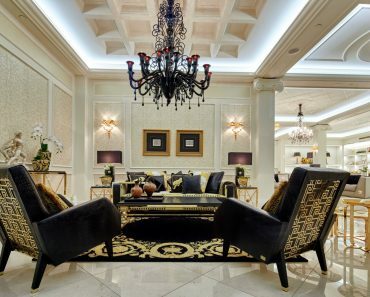 Notice the elegant glass table with Spanish-style decorated chairs all around in the foreground. 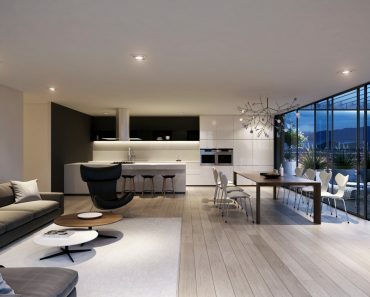 In this example for luxury patio ideas, the patio has been inserted inside a combined space that has the functions of living room and dining room. 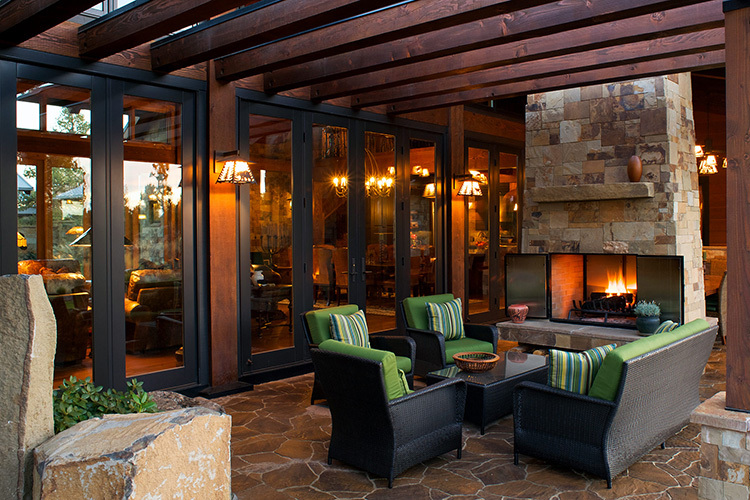 Glass panels divide each functional area from each other, while the stone walls and the arches not only provide some nice ornamental elements, but also demark the patio area inside the space. 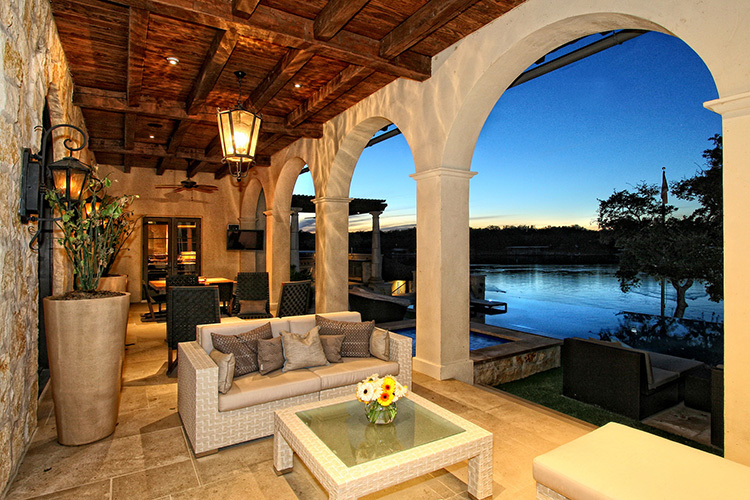 Wooden roof, classical round arches and straight columns characterise this Spanish-style covered patio. In this example for patio ideas, the traditional patio pavers are replaced by stone tiles, which is a bit unusual in these types of patio designs. Guests may have dinner or simply relax in conversation, while enjoying the scenic view on the pond. 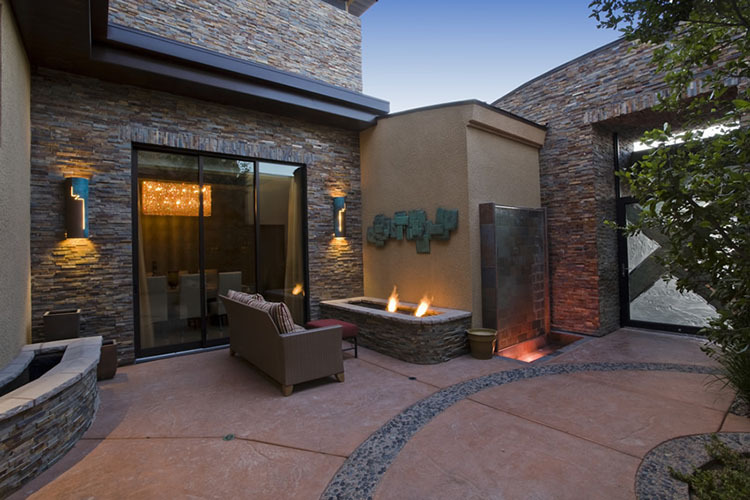 This is a nice example of an avant-garde outdoor patio in our collection of luxury patio designs. The roof is extremely stylized in a structure made out of metal frames and glass panels. The space is totally immersed in the garden, and the tradtional patio stones are replaced by marble tiles. Finally, the fireplace on the right adds a note of pleasant cosiness to the whole composition. South East Asia traditional decorative elements and modern design concepts have been combined in this fine outdoor patio in order to create an informal and familiar ambience, where it is nice to stay and relax with friends. The colours of the patio stones match the colours of the stones of the elegant fireplace placed in the middle. 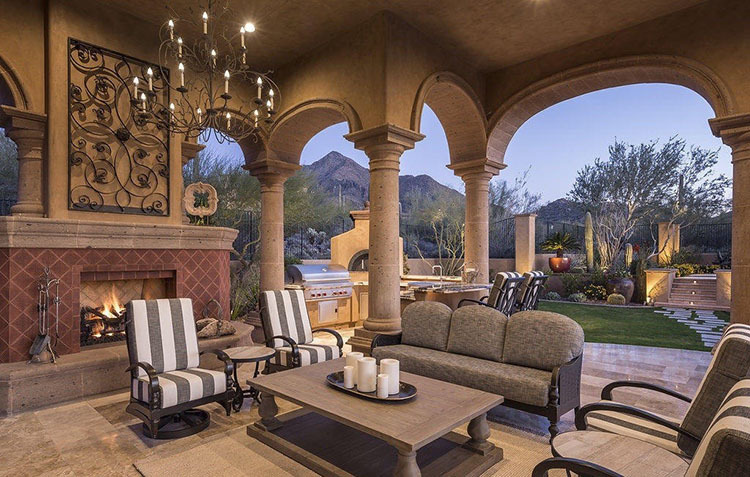 Patio designs are often inspired by exotic cultures or classicism, like in this outdoor patio. The capitals and the spiral decorations of the columns remind of Mycenaean Art, yet these classical elements are inserted in a modern building. The palette utilizes a slightly pink sand colour that perfectly harmonizes with the surrounding desert environment. Sometimes, outdoor patio ideas combine several functional spaces in one, like in this interesting example. 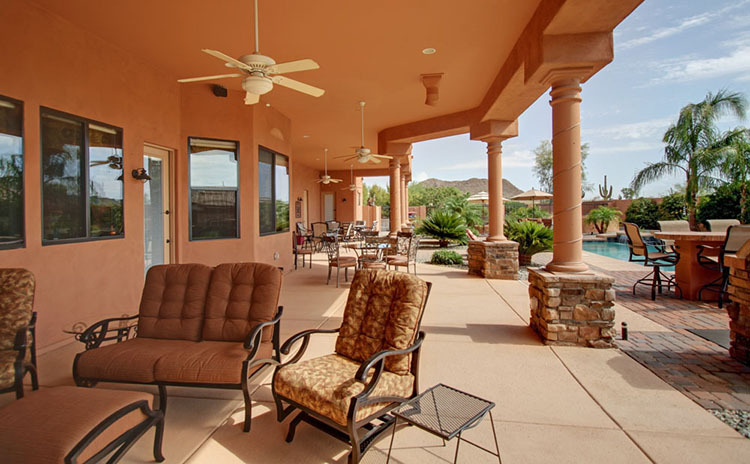 The covered patio takes just a small portion of the wide terrace we see in the foreground, while the rest is used as a living area and furnished with armchairs, couches and a nice table with a small fireplace placed in the middle. 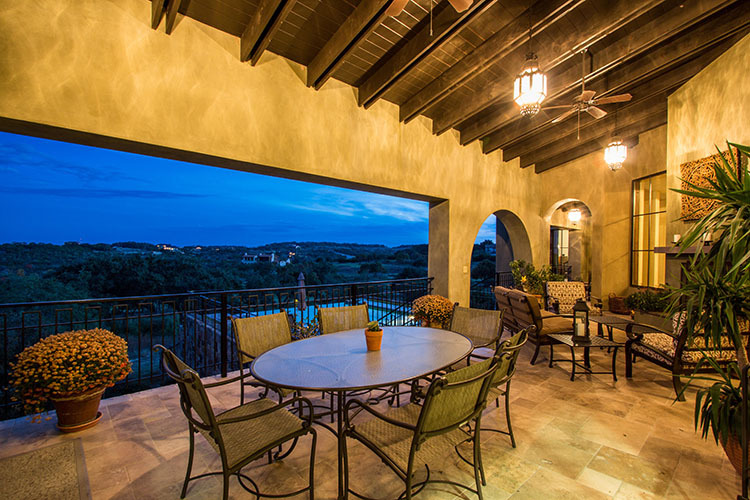 Best outdoor patio ideas often exploit smartly the natural environment around, like in this fine example of Spanish style covered patio that has been provided with a large balcony from which guests can enjoy a stunning view on the valley. Bricks triumph in this example of covered patio, which is also provided with a practical cooking area. The brick fireplace adds a further warm note to a composition that already conveys a feeling of informality and relaxation. 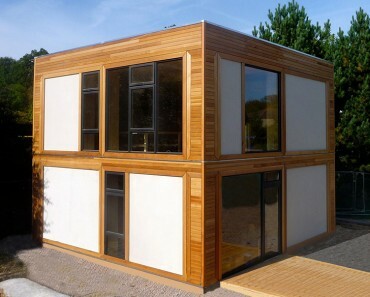 This is a great solution if you need a space where to share nice moments with friends. Swimming pools can be a very inspirational element for many luxury outdoor patio ideas. 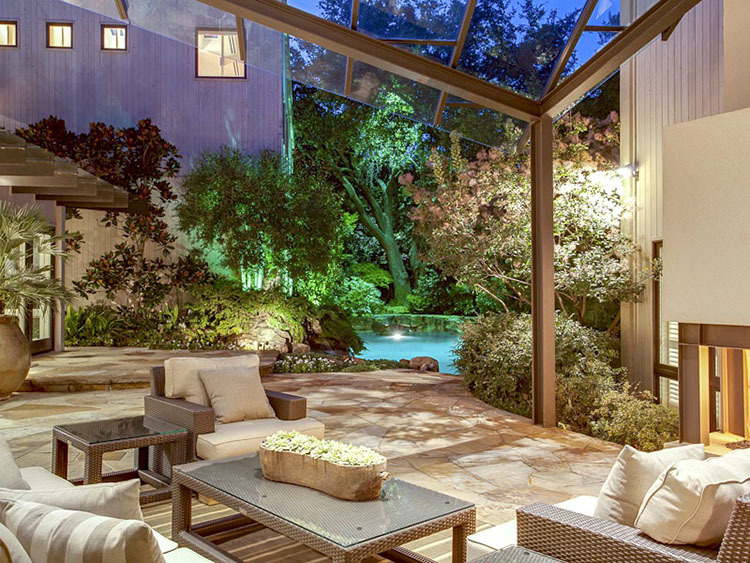 In this example, the patio is set all around the rectangular pool in the foreground, and it is totally integrated with the garden. 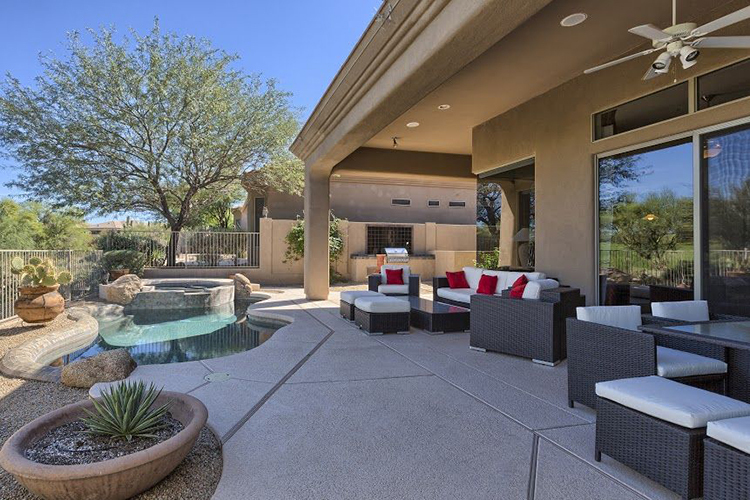 A great patio design for those who need a huge outdoor space where to give parties. 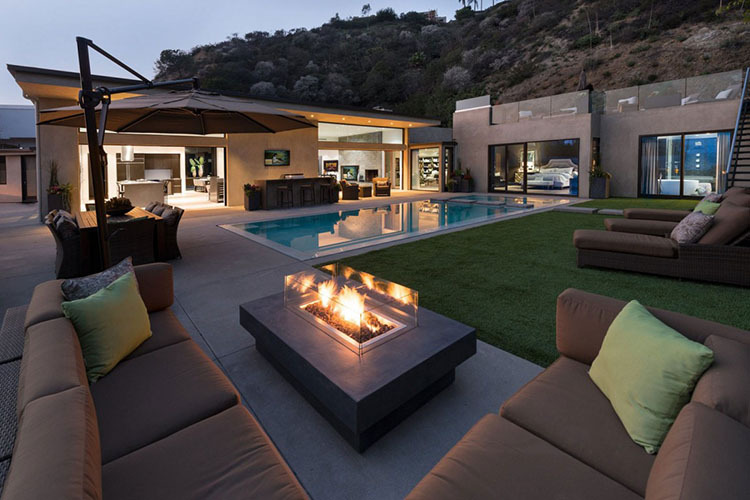 A total integration with a surrounding garden is a common feature of many modern patio designs, like it is clearly shown in this nice example of luxurious outdoor patio. 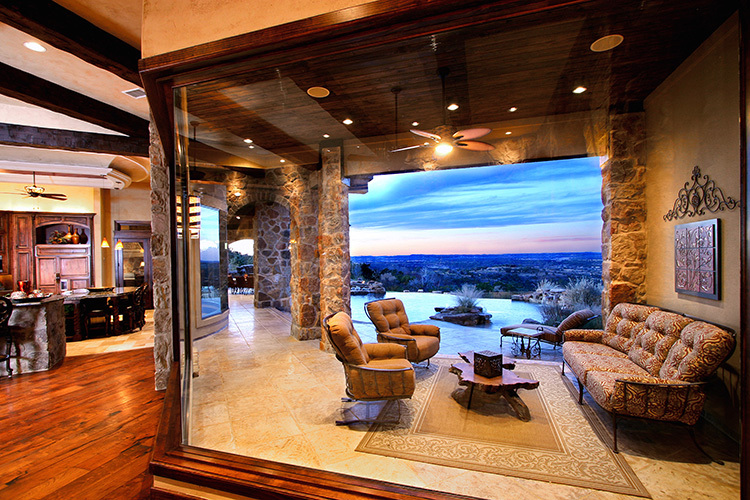 Stone floor, roof in metal frame and glass panel, beautiful view on the near swimming pool. 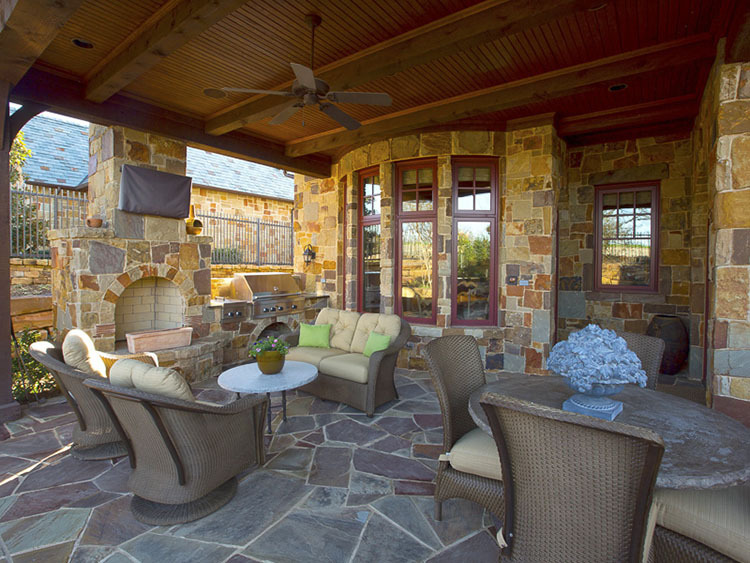 Patio stones can create beautiful decorative effects, like in this nice example of outdoor patio. Notice the unusually pod-shaped fireplace that creates a cute cosy corner where to stay and relax, and the huge French door through which we glimpse a luxurious living room. M.C. Escher has certainly inspired the architect of this covered patio with classical Italian columns and round arches. 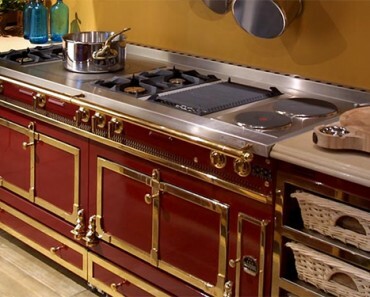 Equipped with cooking and living areas and a big fireplace, it is a great solution for those who need a wide and luxurious space where to invite guests for parties and dinners. 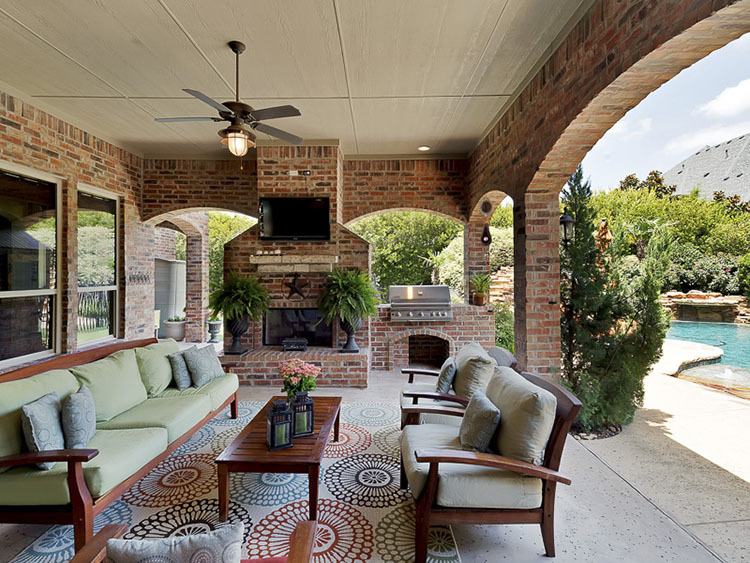 The irregular and colourful patio stones create a pleasantly informal ambience in this nice covered patio fully equipped with fireplace and cooking area. 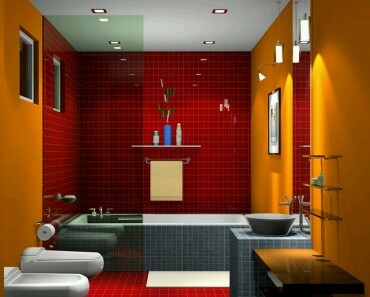 The design is simple and a bit rustic, but not inelegant. This example can be inspirational to those who are looking for outdoor patio ideas that convey a sense of cosiness and familiarity. The utilisation of wood for the columns and the roof vaguely reminds the splendours of the Tibetan architecture, which might have inspired the designer of this covered patio. 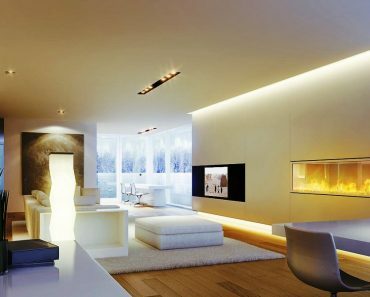 The classical big white fireplace is the central element of the layout, around which the whole composition is built. Notice the patio pavers of concrete that are practical yet beautiful in their bare essentiality. Again, another Indonesian-inspired example for seekers of luxurious outdoor patios. The patio is merged with the huge terrace paved with large concrete tiles that we see in the foreground. The covered area is delimited by the nice Indonesian style columns and arches, and it works as living area.